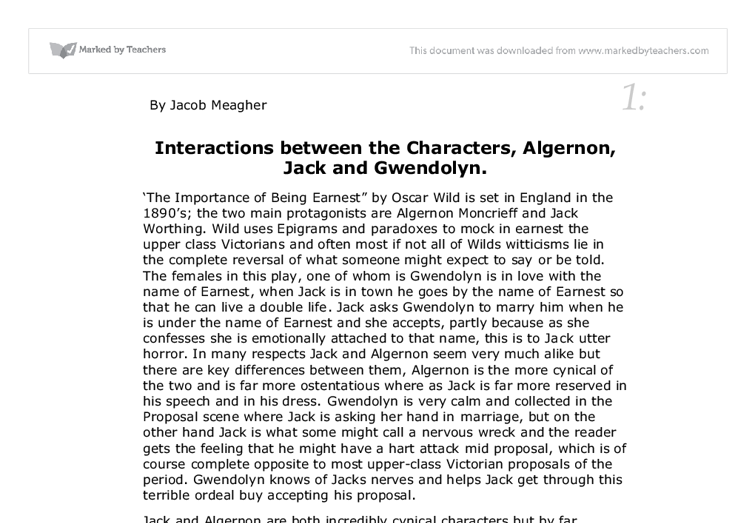 Interactions between the Characters, Algernon, Jack and Gwendolyn. 'The Importance of Being Earnest" by Oscar Wild is set in England in the 1890's; the two main protagonists are Algernon Moncrieff and Jack Worthing. 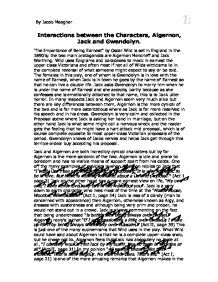 Wild uses Epigrams and paradoxes to mock in earnest the upper class Victorians and often most if not all of Wilds witticisms lie in the complete reversal of what someone might expect to say or be told. The females in this play, one of whom is Gwendolyn is in love with the name of Earnest, when Jack is in town he goes by the name of Earnest so that he can live a double life. Jack asks Gwendolyn to marry him when he is under the name of Earnest and she accepts, partly because as she confesses she is emotionally attached to that name, this is to Jack utter horror. In many respects Jack and Algernon seem very much alike but there are key differences between them, Algernon is the more cynical of the two and is far more ostentatious where as Jack is far more reserved in his speech and in his dress. ...read more. This is just one of the many euphemisms that Wild uses in the play. What Wild could have said about Algernon is that he is a complete upper-class snob, but he chose not to. Algernon feels that Jack has absolutely no taste at all, "I certainly wouldn't let Jack by my outfit. Has no taste in neckties at all" (Act II, page 31) In my opinion "All woman become like their mothers. That is their tragedy. No man ever does. That's his." (Act I, page 21) is one of the more amusing remarks that Algernon makes in the entire play. Algernon love food and drink especially muffins and regards Jacks as not serous enough about food, this is one of the many idle trivialities that Jack does not display. Algernon's level of absurdity far surpasses Jack's with this particular quote from Act I, page 21 "The only way to behave to a woman is to make love to her, if she is pretty, and to some one else, if she is plain" In all farness Jack and Algernon are very much alike but there ...read more. Jack and Algernon are to rich idle young men, whom both are in pursuit of wealthy and upper-class young woman who know absolutely nothing about there lives and accept wedding proposals with absolute credulity, believing that there names are "Earnest". Throughout the play we learn of the two male characters cynical and somewhat hypercritical outlook on life, woman and the society that they live in. The whole play relates back to two things; the plays subtitle 'A Trivial Comedy about Serious People' and the earnestness of the two young men, who paradoxically pass themselves off as having the name Earnest so that they can marry the woman of there dreams. In the end the woman find out the truth of there lovers name but ultimately accept who that are and agree to marry, no longer in earnest. The play is set in earnest and at the end of the play we here Jack say the crux line, "I've now realised for the first time in my life the vital Importance of Bring Earnest" (Act III, page 73) ?? ?? ?? ?? By Jacob Meagher 1: ...read more. One of these methods was the use of Yagan. His dance and song incorporate tradition and cultural influences. Act one, scene two, shows how the Aboriginals (Yagan in particular) saw their world around them and how they dealt with their superstitions. Algernon is constantly talking in the first person always with emphasis on the word "I" this referring to himself, this gives the audience helpful insight into what really matters in life, him! Jack enters dressed in a smart but not ostentations attire, Algernon in contrast is dressed in an ostentatious suit with large cuffs and is eating. In the scene, the narration helped communicate because it gave us a hint of where we were in the play if we went wrong and it described the actual poem to the audience making them become a little more in depth with the play.